The base of the coaching ladder is littered with names of those who weren’t able to make that next step – lower-level head coaches who couldn’t find the same success at a bigger school or assistants who struggled in their first head coaching job. And then there is Kelly Graves, a shining example of movin’ on up. In March of 2014, Graves was coaching Gonzaga in its sixth-straight NCAA Tournament. Oregon finished 16-16. It was a match made in heaven – the charismatic coach and the woebegone major program. 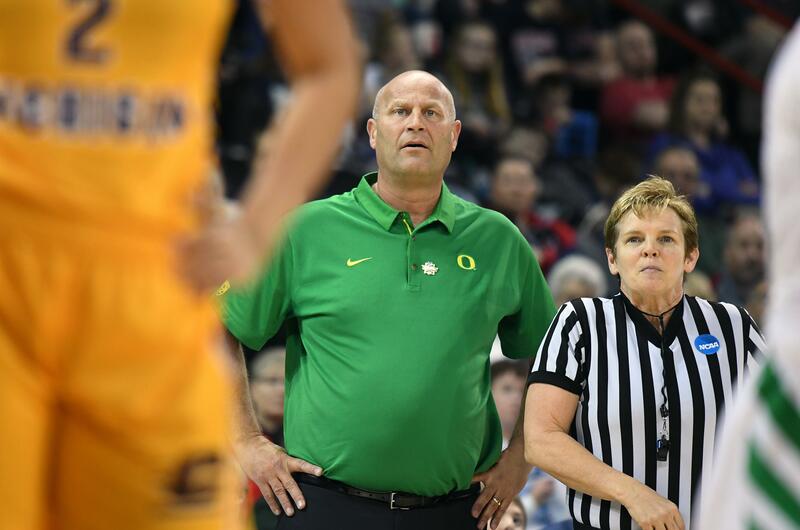 Now, Graves has the Ducks (33-4) in their second-straight Elite Eight with the second seed in the Spokane Regional, favored by some to knock off top-seeded Notre Dame (32-3) Monday night. Tip-off at the Arena is 6 p.m.
It’s accurate to say Gonzaga made the Oregon program what it is today. But if Graves has made it look easy, he begs to differ. “We worked pretty hard at it,” he said. It’s all about recruiting for Graves and his staff, including assistant Jodie Berry, who followed him from GU. But it wasn’t about recruiting next-level athletes, it was about landing more of them. Increase their batting average, if you will. “It wasn’t a huge jump in terms of the talent level,” Graves said. “We always felt at Gonzaga we were not a midmajor, so we went after the major players. It was the convergence of hard work, force of personality, timing and luck that made Gonzaga a player for players. By the time Gonzaga went from 5-23 his first year to 28-4 his fifth, people started to fill the gym. Meanwhile, the Washington and Oregon schools were struggling to be competitive in the Pac-12. All the Zags needed was a little good fortune and Lewis and Clark star Heather Bowman, who only visited Pac-12 schools but wanted to stay home. She set the WCC record with 2,165 career points. Courtney Vandersloot came a year later. Overlooked in high school, Vandersloot is the only Division-I player with 2,000 career points and 1,000 career assists. Tiffany Shives was transferring from Michigan State and picked the school where the star player, Adam Morrison, was also a diabetic. Big-name players like Kelsey Plum, the NCAA’s all-time leading scorer at Washington, and future Cal standout Reshanda Gray, took official visits to Spokane and some like Stanford star Brittney McPhee didn’t scoff. “We were in the picture,” Graves said. “The ones we did get – Kayla Standish, Bowman, Janelle Bekkering –those guys were big-time players. More transfers arrived: Katelyn Redmon (UW), Hayden Palmer (Oregon State), Taelor Karr (Kansas State) and Lindsay Sherbert (Cal). Then the personable Graves, who had a great relationship with high school and club coaches because his team played a fun, uptempo style, picked up two gold medals as an assistant coach with USA Basketball. It was just a matter of time until the right opportunity came along and when it did, Graves just transferred his Gonzaga blueprint to Oregon. “Because of our success at Gonzaga, there as a belief that, ‘OK, this guy is pretty good,’ so I was able to go to those same clubs we were before,” he said. And the Ducks he has landed are an impressive lot. Oregon senior Lexi Bando was headed to Gonzaga but was committed to Graves. There was no skulduggery, Bando is from Eugene and told Graves when he was recruiting her for the Bulldogs that the only reason she was going there was because Gonzaga was a better program than Oregon. Also this year, UO sophomore Sabrina Ionescu set the Division-I record for career triple-doubles and just missed her 11th by one rebound in an 83-69 Sweet 16 win over Central Michigan on Saturday. She also has a Pac-12 record 294 assists this season. Meanwhile, classmate Ruthy Hebard made 33 consecutive shots over four games, a D-I record for women and men. Satou Sabally was the Pac-12 Freshman of the Year. Let former Gonzaga Prep star Oti Gildon, the Ducks’ super sub, explain why she’s not at GU. With the Ducks ranked sixth in the final Associated Press poll and a No. 2 seed, it’s obvious Graves and staff are closing a lot of deals. Amenities even he couldn’t pass up. So believe it when he says, “I envisioned this,” because he said the same thing in the same building seven years ago. Published: March 25, 2018, 5:49 p.m. Updated: March 25, 2018, 8:59 p.m.